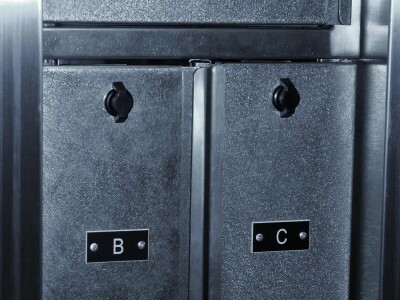 Weapons Lockers Peace of Mind and Security | Donnegan Systems Inc.
Duxbury, Massachusetts, a coastal suburb of Boston, is steeped in history that dates back to English settlers who originally established nearby Plymouth colony in 1620. Through the years, it’s become home to over 15,000 residents and boasts not only rich history and beautiful coastlines, but also a ranking as the 10th safest city in Massachusetts in 2015. Until 2011, Duxbury was also home to a police station that was becoming rather historic itself. Built in the 1960s, the building’s facilities were outdated, overcrowded, and disrupting day-to-day activities at the Duxbury Police Department. As centralized evidence and records storage space ran out, the police department resorted to putting documents and items in boxes and filing cabinets in multiple areas of the building. Items became increasingly difficult to find as more evidence and records piled up – and without an easy way to locate and purge old records and evidence, the problem was only increasing day by day. “Our storage system was basically nonexistent,” said Duxbury PD’s Investigations Lieutenant. To add to the storage challenge, the old building had an ongoing water leak in the storage area which was causing moldy boxes and damaged records. Not only was the water issue a nuisance – it also required taking the time to recover and restore damaged documents and materials, and the mold was a potential health risk for officers and employees. In 2011, the Duxbury community voted to approve construction on a brand new facility for Duxbury PD – a perfect opportunity to tackle the storage challenges and to do it right from the start. To aid in the planning process, the Investigations Lieutenant talked to other officers and toured nearby public safety buildings to gain insight on what storage layouts worked best in similar facilities. 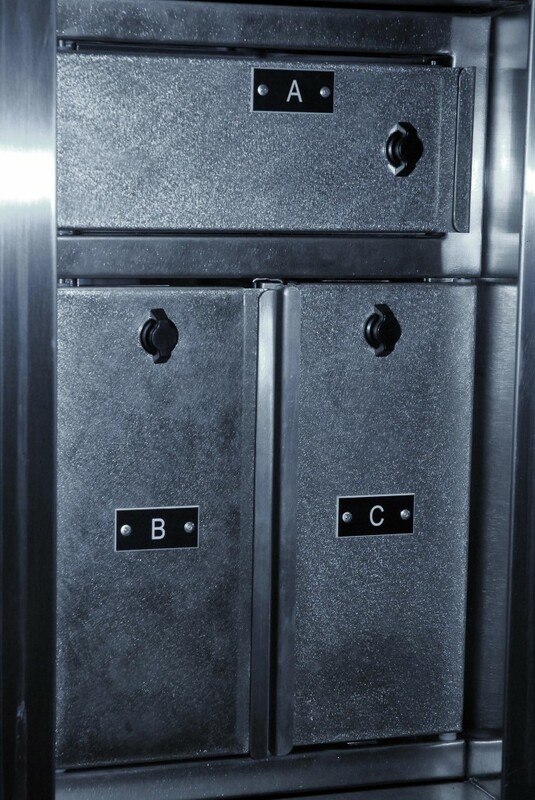 After seeing a number of facilities with Spacesaver weapons storage, evidence storage, and lockers, the Lieutenant reached out to Mark Wencis, a sales representative at Donnegan. With years of experience planning storage systems in the public safety market, Mark partnered with Duxbury PD to assess their inventory of items and understand the unique needs of the department. Because Mark was involved early in the design process, he was able to design a system that fit the specific needs of the department, such as accommodating the most common types of evidence that the department saw coming in. The most unique part of the installation came in the form of a specially engineered armory locker. As a smaller police department, Duxbury needed a way to store their smaller inventory of weapons that would keep all items secure and accounted for. 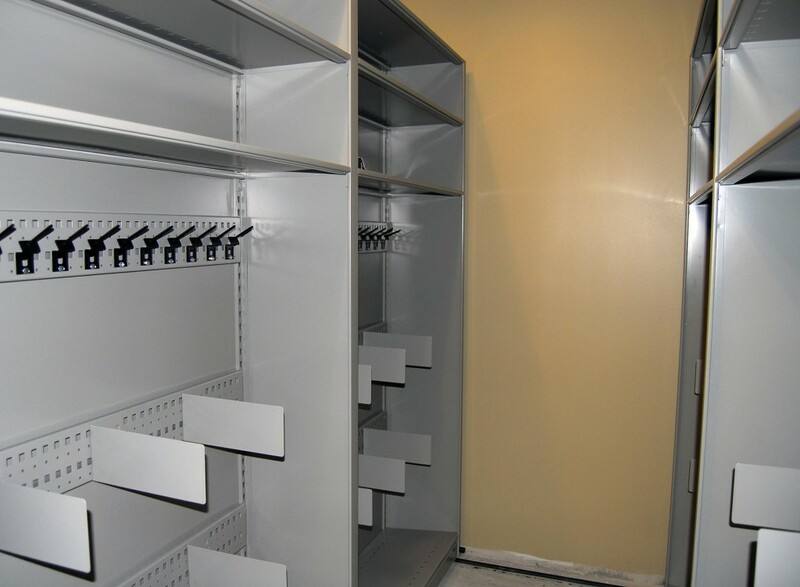 When a traditional weapons locker proved to be more that what they needed, Mark worked with the Investigations Lieutenant to design a personal storage locker – but swapped out the back panel for a weapons rack. 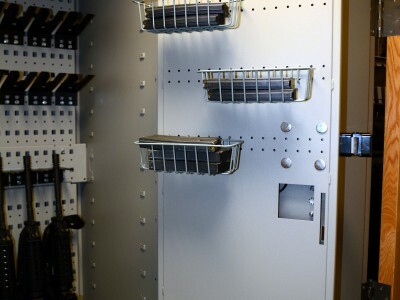 The custom weapons locker has Taser brackets, barrel supports, and an accessories panel so that all accessories can be stored in the same locker as the guns. 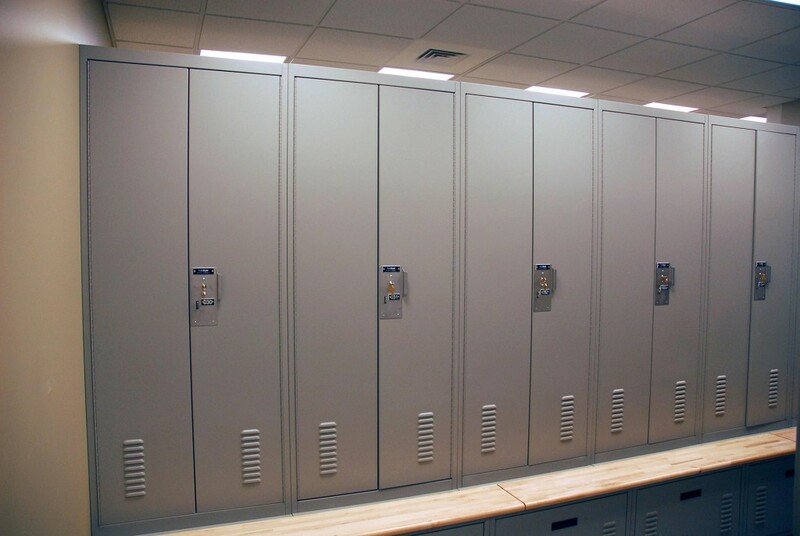 The locker was even hardwired to incorporate the department’s key card scanning system and weapon RFID stickers to prevent unauthorized access and ensure that all weapons are accounted for. 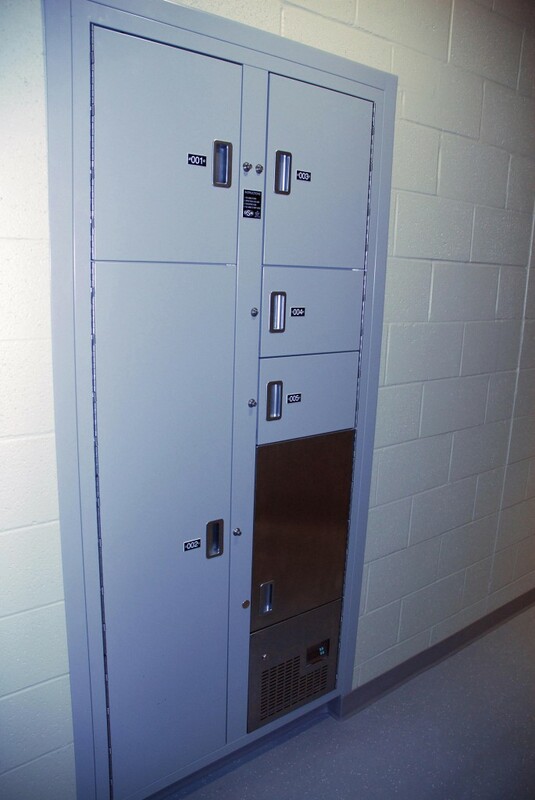 This weapons locker solution was so successful at Duxbury PD that the weapons locker is now a part of our product offering – the Weapons Evidence Locker. 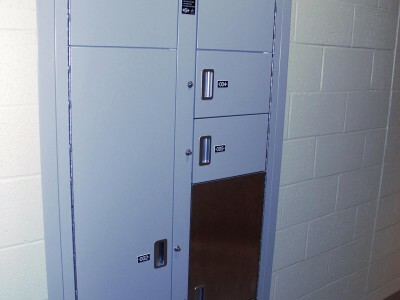 In the evidence processing area, Donnegan installed a new bank of pass-through evidence lockers in multiple shapes and sizes – including a refrigerated compartment – so that officers can drop off all types of evidence no matter what time they return to the station. An evidence technician can then retrieve the items from the other side of the wall, keeping the chain of custody secure. Long term evidence and records are now housed on a new high density mobile storage system, which allows greater storage capacity and organization in a smaller footprint. In addition to the evidence storage, Donnegan also gave the locker room a facelift with reconfigurable personal storage lockers and installed wall-mounted gun lockers in the corrections area where officers could temporarily deposit their handguns. Since the installation, the Duxbury Police Department has been operating much more smoothly. “You don’t have to figure out where you’re going to put things anymore – you just put it where it belongs in the system,” says Duxbury PD’s Investigations Lieutenant. The addition of secure weapons lockers and a more efficient evidence storage system has added much needed peace of mind for the agency, and employees no longer have to waste time searching for missing items. Learn more about how Donnegan can provide start-to-finish solutions for the specific needs of your public safety building by downloading our public safety brochure.